Putting modesty to one side, as sales leaders, there is very little we don’t already know about our own sales process. Our knowledge of what is necessary to succeed runs deep. We’ve shaped our team so they drive that success. We have laboured over sales incentives that reward our reps when they bring home the bacon. We know what it takes to successfully navigate the sales process. In the same way, we understand what the right activities are at each stage of the deal lifecycle. We also know the right cadence of buyer interaction. However, we seem to struggle to effectively drive our reps using these sales ‘best practice’ metrics. The result is that the core of our sales team tends to get a little lost along the way. Their deals are unhealthy and ultimately wither because they haven’t covered the basics. The unspoken truth is that we are failing to extract the full potential from our sales team. In turn, this means we are failing to capitalise on the opportunity that is in front of us. Modern sales leaders have developed an alternative way of thinking about sales incentives. They focus on motivating and driving the steps that make up the most efficient sales journey. They manage by metrics that span the sales process. And it’s an approach that is driving significant results. Tracking, motivating and rewarding the ‘key performance indicators’ (KPIs) that span the entire sales journey is vital. It is only through these KPIs that we can be sure of the healthy progress of our deals. Here’s where understanding the difference between ‘Lagging’ & ‘Leading’ KPIs is important. Traditional sales leaders manage by Lagging KPIs alone. For example, the number or value of deals closed would be considered as lagging KPIs. These are the indicators that tell us what has happened. They are the final output of our efforts. These KPIs are nearly always rear-facing. They’re easy to measure but very difficult to directly improve. The traditional approach to constructing sales incentives is to tie them directly to lagging KPIs. However, many forward-thinking sales leaders are now directing their teams using Leading KPIs (e.g. “number of meaningful call connects made in a day”, “number of meetings booked in a week”). These indicators are forward facing and give a true insight into the health of our deals. Rather than tracking end results alone, modern sales leaders measure the steps necessary to reach our desired destination. These are the steps that have the biggest impact on us successfully achieving the outcome we desire. To really influence the performance of your sales team, you should seek to carefully track, motivate and incentivise your teams to achieve both types of KPI. See them as part of an equation where action (leading KPIs) equals results (lagging KPIs). They represent bite-sized, easily consumable targets: For example, say your target for the next six months is £100K. By keeping an eye on Leading KPI targets such as regular contribution to your pipeline, number of meetings booked or deal velocity through the pipeline, you will have a better idea of whether you’re on track to meet your target or not. They serve as great coaching prompts: Asking a sales rep to sell more is a bit like asking a striker in a football match to score more goals. They know that’s the aim of the game and the result that is desired. But they don’t always know the best route to get there. Instead, teach them the steps necessary to reach their goal. 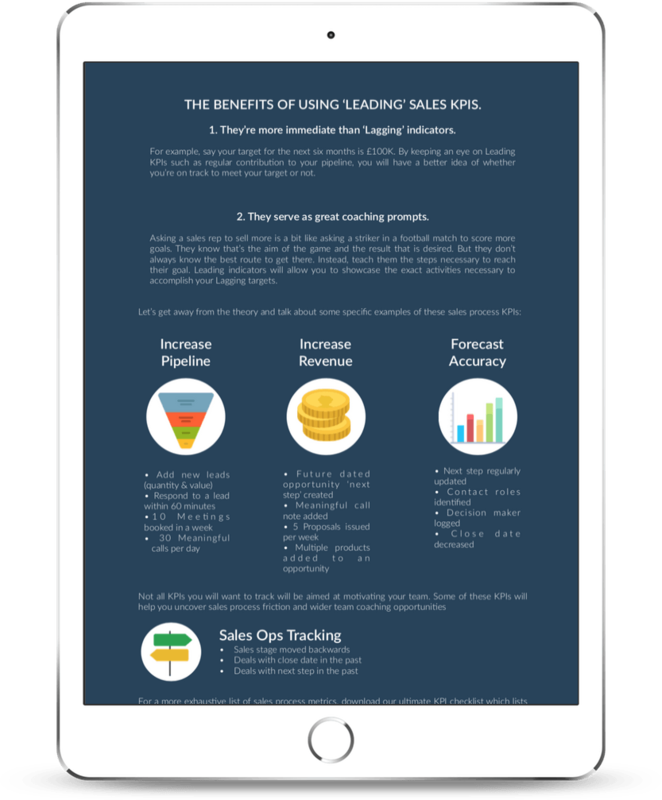 Leading indicators will allow you to showcase the exact activities necessary to accomplish your Lagging targets. Reward Leading as well as Lagging KPIs: The fastest way to positively impact sales performance is to drive more of the high-value, ‘winning’ sales behaviours. These are the leading KPIs that make the lagging KPIs a reality. Time-based & aggregated KPIs: Track not just the actions (e.g. “how many calls did I make”) behind your outcomes but how often these occur (e.g. “I need to make 40 calls per day that connect to a target job title and last longer than 15 minutes”). To work out exactly what sort of timeframe you should be expecting to see, analyse the behaviours of your top reps. What cadence of work do they have? Once you work out what magic number they swear by, promote this level of activity across the rest of your team. Negative behaviours: If what you’re seeking is absolute clarity, don’t stop at behaviours leading to positive outcomes. Track the habits that constantly trip up your progress (e.g., track how often close dates lapse into the past, sales stages are skipped or where deal amounts become volatile). Getting a tighter grip on this will improve deal health and forecast accuracy. Only by identifying what’s damaging for our businesses can we protect ourselves from it. Typically, sales reps are measured and incentivised purely on end results; like how many deals they closed this month. Thus, they don’t always cover the basics or operate with the cadence you desire. But, if you want to improve performance right across your team, start motivating your reps to achieve against leading KPIs. Looking for fresh ideas on sales incentives? Well, we have 115 pretty neat ones! Why not get started by downloading our guide detailing 115 sales incentive ideas.